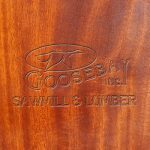 Mahogany, Cuban - Goosebay Sawmill and Lumber, Inc.
Cuban Mahogany (Swietenia Mahogani) is the original and historic mahogany so prized by early furniture makers such as Thomas Chippendale, Thomas Sheridan and Duncan Phype. Native to the southern tip of Florida throughout the Caribbean, Cuban Mahogany works and machines very well and it is very stable. It stains and finishes well. The heartwood varies from a pale pinkish brown to a darker reddish brown. The color deepens as the wood ages. It has a Janka hardness rating of 930. Because of its popularity, and because there were no logging restrictions, the species was so over harvested that its export from Cuba was banned in 1946. It is now listed by CITES as an endangered species. Although Cuban is the original genuine mahogany, it has been so long since the wood has been readily available that the term “genuine mahogany” now refers to the genus swietenia macrophylla, otherwise known as Honduran Mahogany. The Cuban Mahogany that we stock is old growth trees from the Florida Keys. The wood is harvested from trees blown down in winter storms, contracted tree removals (e.g. tree services), and from trim harvesting. 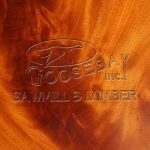 It has been sawn live edge in thicknesses ranging from 5/4 through 12/4. Some pieces are up to 22 inches wide and 7 feet long. It has been air dried for a minimum of 5 years. Some pieces contain crotch figure. Resistance to decay and termites has made this mahogany prized for boatbuilding. Its beauty and workability has let to its use in furniture, cabinetry, turnings, veneers, musical instruments, and carving.